Best Offer is Droom’s one of exclusive pricing formats which gives the user a privilege to negotiate on a price with the seller. Users have the privilege to submit up to 5 pricing offers for every listing. This helps the user get a deal that suits his budget and guarantees buying satisfaction. The Best Offer format is one of its kind when we take e-commerce into account and given the fact that the used car market is so unorganised, it helps the user make a price friendly and a satisfactory buy. At Droom, it has been our mission to make the used car market as favorable and transparent as it can get for our users. This led us to improvise the Best Offer deal and make the process more intuitive and user friendly. The improvisation of the Best Offer deal starts with the simplification of the whole transaction process. Earlier, before a user could quote an offer for the seller, he/she was required to first pay the token amount on the listed price after which the user was able to offer a price to the seller. We found out that this is a point on the transaction cycle which discourages many buyers from submitting an offer as they do not want to shell out any money before a price has been decided by both the parties. This has been modified. Now the user does not need to pay the token amount anymore to submit a bid. 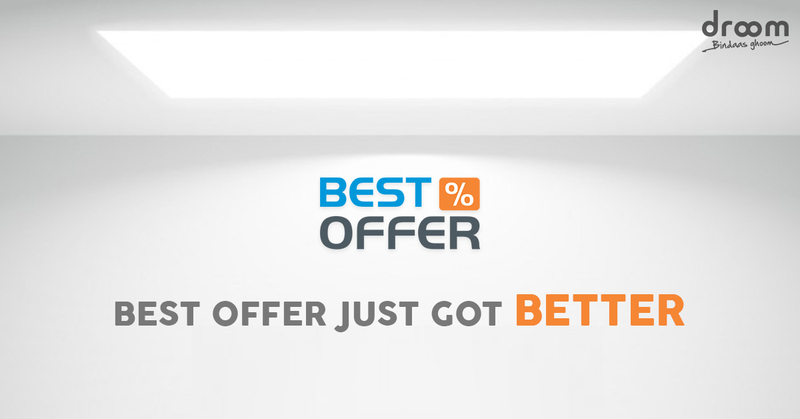 If the user likes any listing under the Best Offer deals, he/she can now directly quote an offer to the seller. Upto 5 pricing bids can be offered per listing. Once the seller accepts a particular offer, the buyer gets a notification via e-mail regarding the accepted offer. He/She then gets a 12 hours window to pay the token amount. Also during the 12 hour window, the listing shall be deactivated from our website so that no other offer can be made to the seller on the same listing. We believe this will make the transaction more reliable and satisfactory for the user as he/she is not expected to pay any amount before he/she gets a suitable deal. So what’s stopping you? Log on to our website www.droom.in today and bargain your way to the wheels of your dream. 1. What is Best Offer? Best offer is one of the pricing formats provided on Droom platform. This format allows the sellers and buyers to negotiate on price and land onto a mutually accepted one. Buyer(s) can make a maximum of 5 price-based offers and the seller may accept or reject any of the offers. 2. How many offers can a buyer make? A buyer can make a maximum of 5 price-based offers against a particular vehicle listing. The seller may accept or reject any of the offers. 3. Does the buyer need to pay before making an offer? No. We have recently changed and simplified the process of making a best offer for the buyer. Now, a buyer can make a max of 5 offers against a listing. If any one of his offers is accepted by the seller, a mail containing the link to make payment will be shared with the buyer to make the token amount payment. 4. How can the buyer make the payment if his offer gets accepted? The buyer will be sent a mail, in case his/her offer is accepted, containing the link of the listing to make the payment. He/she can also login to his/her account on Droom platform and make payment against the offer. 5. How long does the buyer have to make the payment once his order gets accepted? Please note that the buyer will have 12 hours to make the payment, once his/her offer is accepted. In case the buyer fails to make the payment within 12 hours, the offer will be considered expired and the seller can accept offers from other buyers. 6. Can a seller accept offers from multiple buyers? No, a seller cannot accept multiple offers or offers from different buyers at a time. As soon as a seller receives a best offer against his vehicle listing, and he accepts the offer from a buyer, all other offers will get suspended for 12 hours, during which the buyer can make the token amount payment via droom platform. In case the buyer fails to make this payment on time, only then, the seller can accept any of the other offers. ECO App Offers Unbiased & Objective Auto Inspection!